The Propex HS2211 can be mounted externally underneath the vehicle freeing up valuable interior space. The furnace is a propane fired blown air heating system. Offering energy-efficient, thermostatically controlled blown hot air totally independent of the engine. Designed especially for recreational vehicle use. This externally mounted, space saving, propane fired furnace is a popular choice for VW Bus, Vanagon & Eurovan Heating systems as well as campers and other RVs. 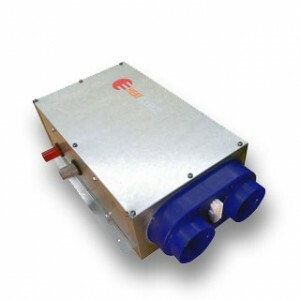 The Propex Heatsource HS2211 furnace can be mounted underneath the vehicle. Various bracket fixings allow different positions and orientations for mounting, increasing fitting options under floors or up between chassis rails. Space is always particularly valuable and these external mounting options make sure your cabin is kept as free as possible. This feature also allows for greater freedom in interior design. We always choose the finest motors and fans for blown air heaters. This combined with clever electronics means that any noise is kept to a bare minimum. You will notice how much quieter a Propex furnace is when compared to a regular space heater. The HS2211 can be supplied with complete fitting kits to suit underfloor installations, with kits available to cover the number of outlets required. The low profile design of the heater means no pipes or easily snagged parts are left exposed and so maintaining the ground clearance of the vehicle. In vehicles and caravans the furnace is usually mounted under the floor or between chassis rails, with some vehicle specific mounting kits available, the combustion pipes are then lead out to the side of the vehicle. The furnace is corrosion resistant and sealed against the ingress of water, however suitable precautions should be made to protect the heater from direct road spray and debris. Read the HS2211 underfloor installation guide.